I would be lying if I said all of my flowers are still beautiful! Most of the perennials are done blooming for the season, and some of the annuals are starting to decline. Today I am going to share annuals that you saw in my earlier posts this season and what they look now. 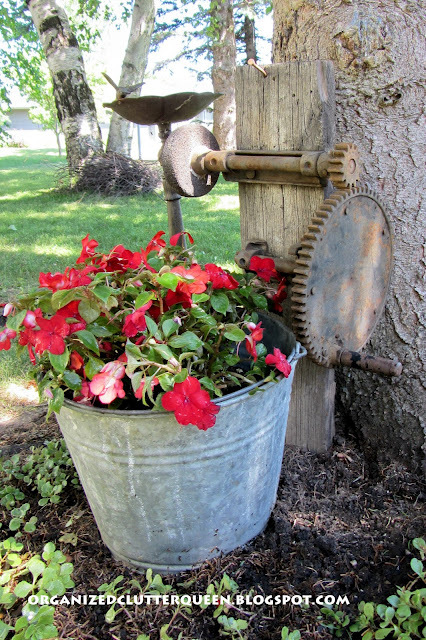 From the post "Free Junk", a galvanized pail with red impatiens and Grandpa's old knife sharpener setup attached to a board. How the pail looks today! From the post "Outdoor This and That 3". 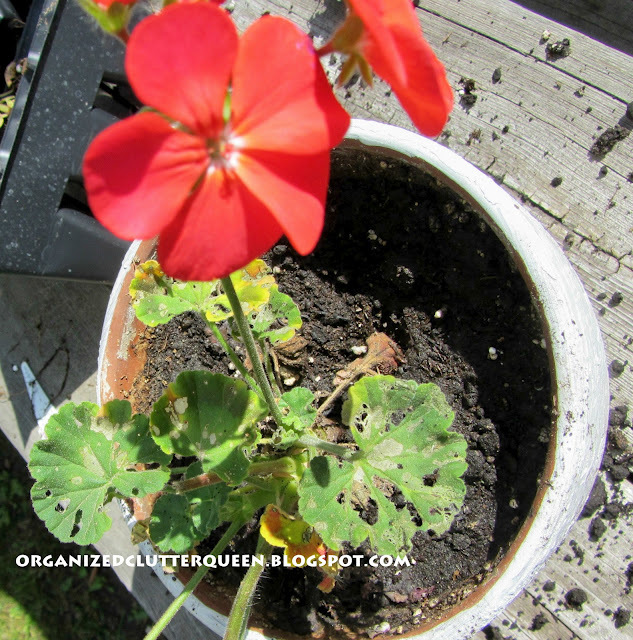 Window box geraniums under attack by cutworm caterpillars. Window boxes re-planted with Coleus bedding plants about June 20th. 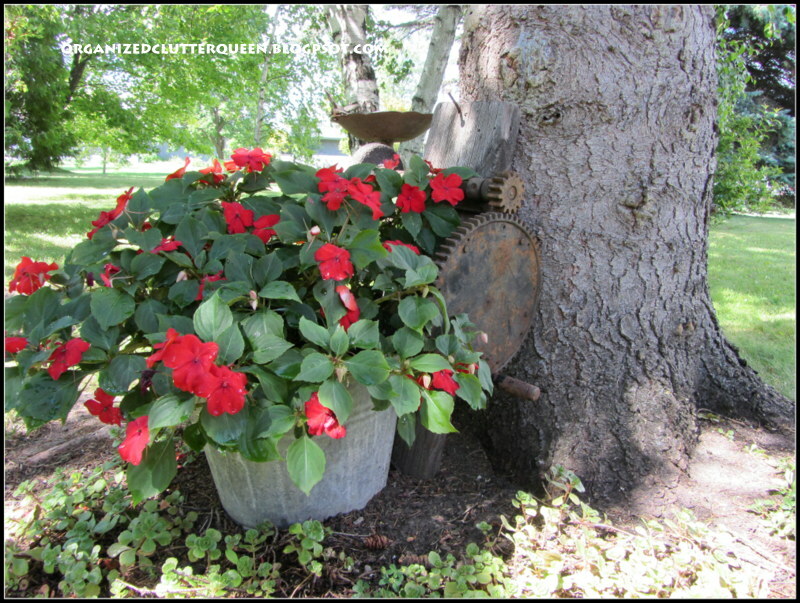 Damaged geraniums moved to flower beds. 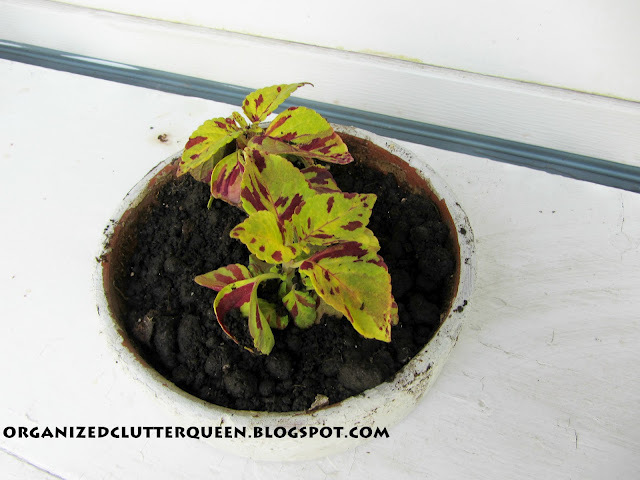 Here are the coleus today. This was an experiment! 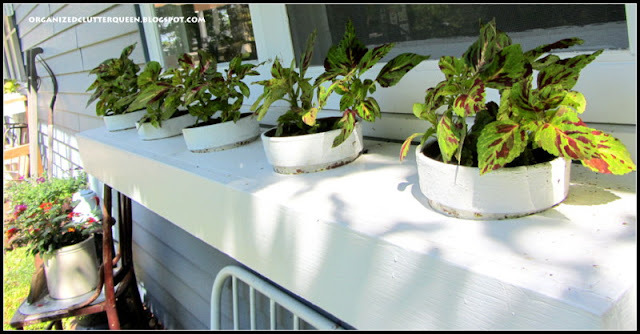 I have never grown coleus in these window boxes. Also they were planted pretty late in the season, around June 20th, they never really thrived. Probably won't do this again! This photo is from the post "Vintage Garden Tools & Toolbox". Here is the toolbox today. The impatiens has filled out but remained quite small in the small pot. 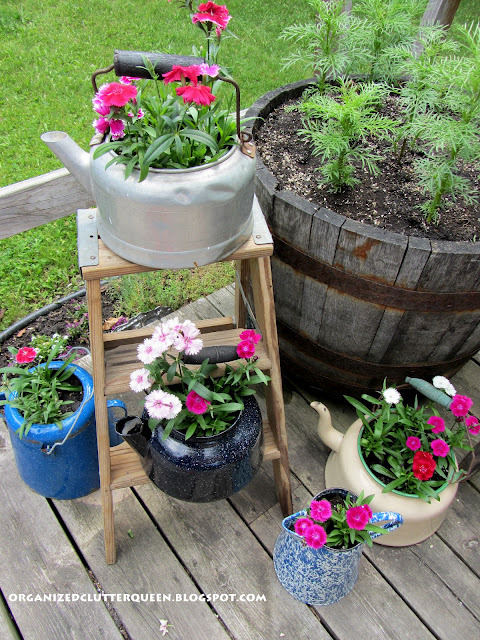 From the post "Outdoor This and That 2", my mini step ladder and tea kettles with dianthus. 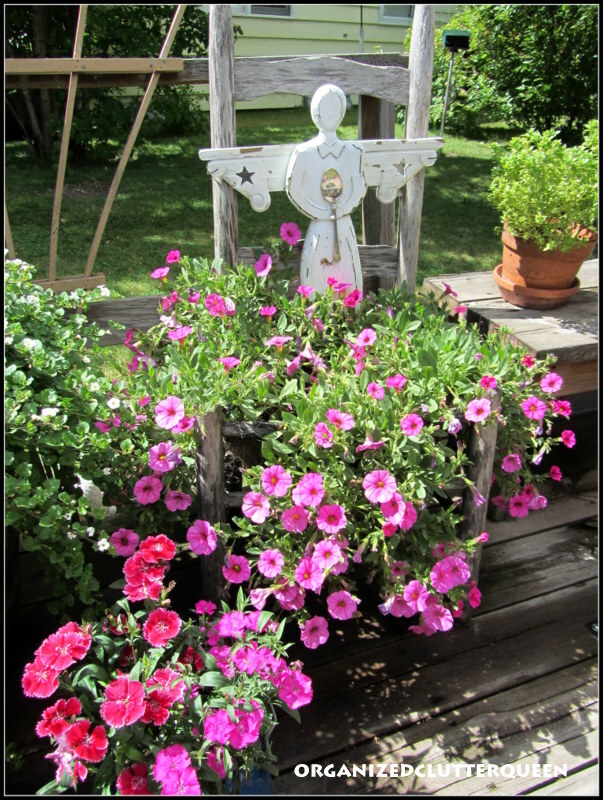 The dianthus today are bigger and still doing well! The cosmos from the before photo are gone. Pulled out. They started blossoming with no petals. Scads of blossoms and no petals. Ugly! From the post "My Weathered Gray Chair 2012". This is a flower that is bigger now but not necessarily better. 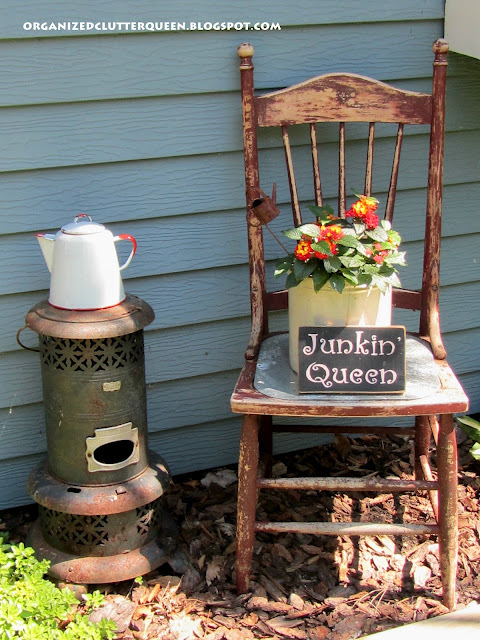 From the post "The Junk Garden Queen". The lantana is still blooming nicely and is larger. 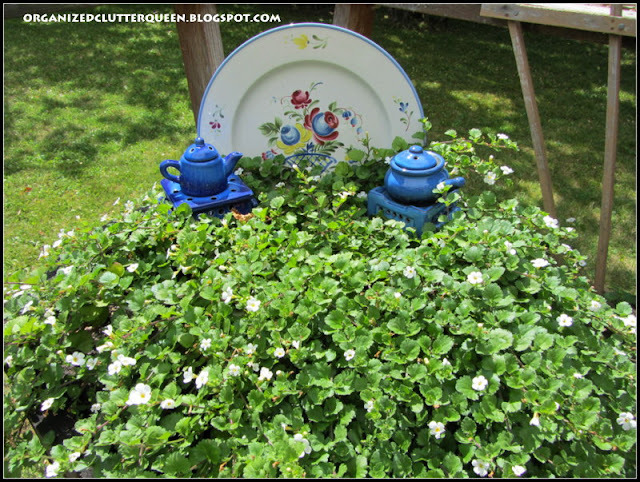 From the post "Out Thrifting" came this photo of two bacopa in a roaster lid and thrifty finds! And today the roaster is sitting in the barrel that held the sickly cosmos! Not too many weeks of gardening here in Northern Minnesota left, as we can get frost in early September. I hope you enjoyed my summer outdoor posts. Your plants still look way better than mine! My Wave petunias look like it's the middle of Sept. not August! 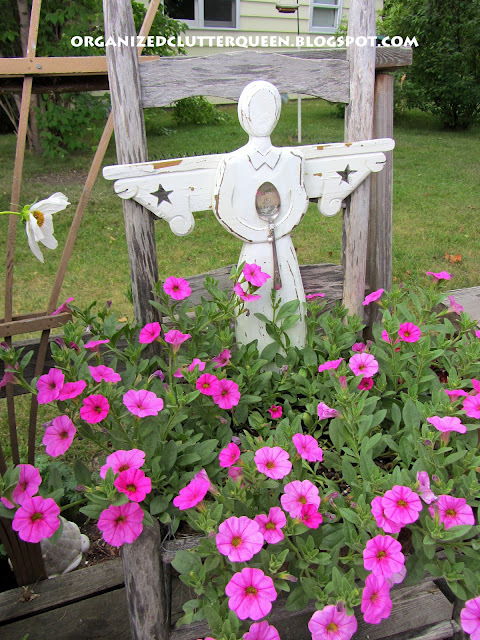 I think something is killing my phlox and I just saw the first morning glory blossom on Monday. I hope they bloom more before we get a frost!!! I really enjoyed that! Amazing how well (most) everything did! The tea kettles looked fantastic. Frost in September. Hard to imagine. We get so excited about fall, but never even get to put a sweater on until late October. My son usually wears shorts into November. I hope you can enjoy your flowers for many more weeks...they are gorgeous! O, your plants look fabulous beside my pitiful ones. First off, I do NOT have a green thumb, at all....second, our 3 digit temps here and lack of water due to a horrible drought has just about taken every flower I had. The only thing doing halfway decent is the Rose of Sharon. We generally have hot weather out here thru Sept. and very little rain or snow. 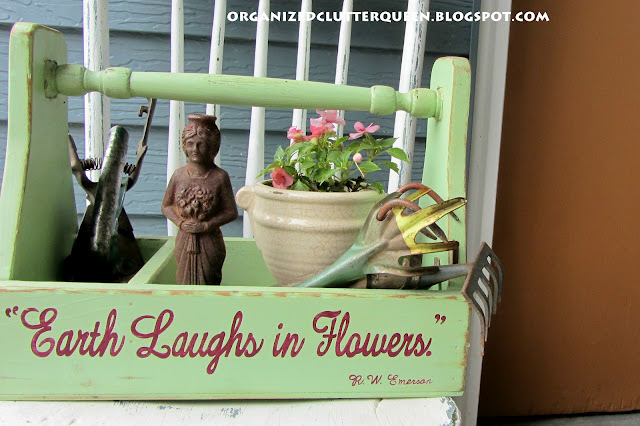 Your flowers look adorable with all the cute things you have around. 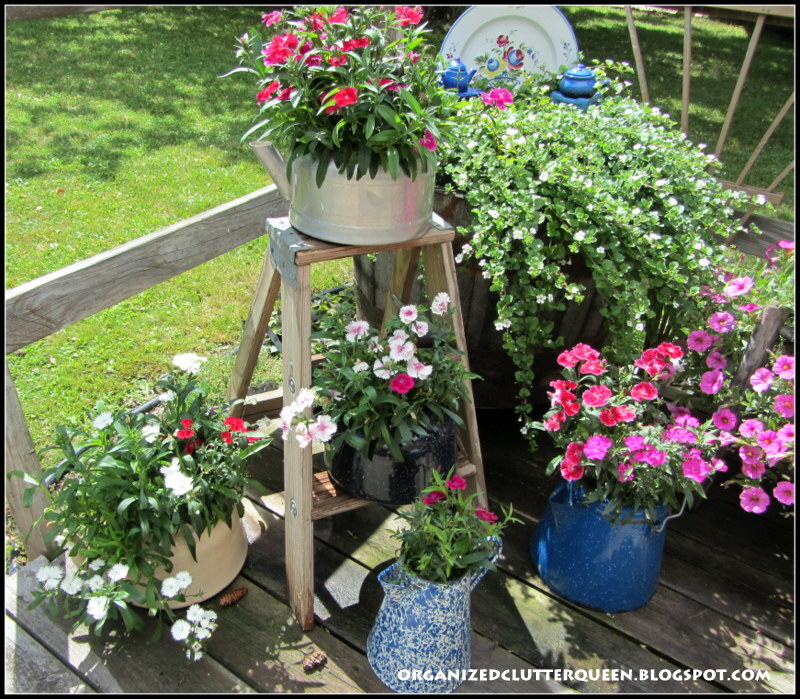 I enjoyed your pictures and I think your plants and flowers have done great ! It is hard to imagine frost in September because we usually do not experience a freeze until January or February... I love how you stay so organized too ! Everything is looking so lush and beautiful in your amazing garden! I will now be on the look out for old tea kettles! I love yours! We live in Wisconsin. I think this crazy spring and subsequent wacky summer has done a huge number on all of our growing things. Including the grass and the trees. I think we will feel these effects for some time. Being this hot and dry summer, I think your plants look great! It seems all we do is water our gardens... and then water some more. It just isn't the same as good wonderful rain! Next year will be different, I would bet,,,, and hope. They say the Fall color will be drastically affected also. Every year is a new adventure when gardening!! 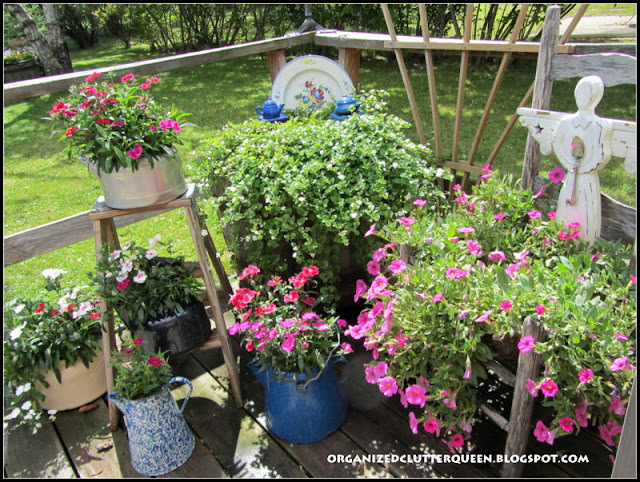 Gosh, Carlene all your annuals look lush, healthy and beautiful! 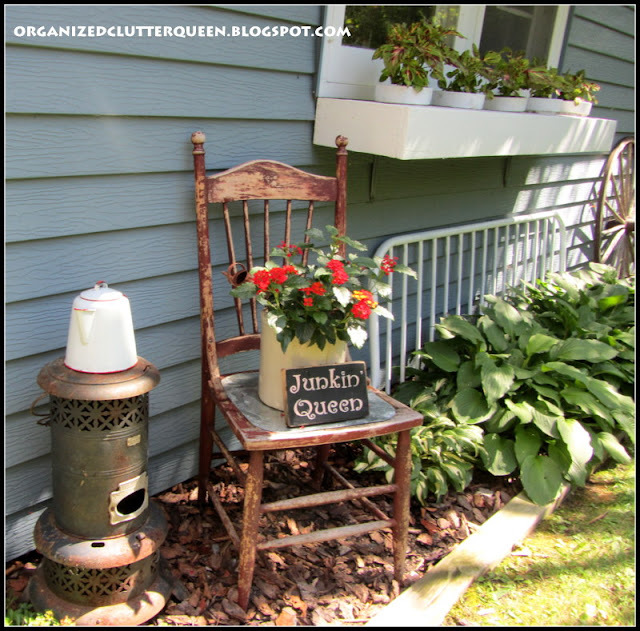 You give junk a new meaning..now everybody's going to be stopping at every yard sale, hoping to see junk like yours..Thanks for sharing.! 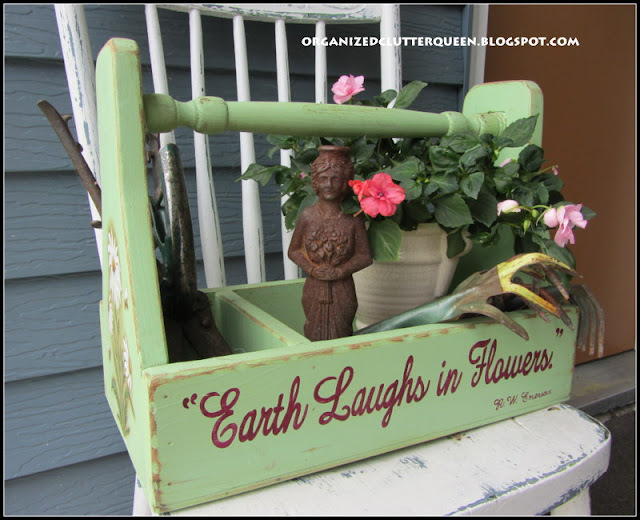 I am so glad you linked up over at Funky Junk Interiors! 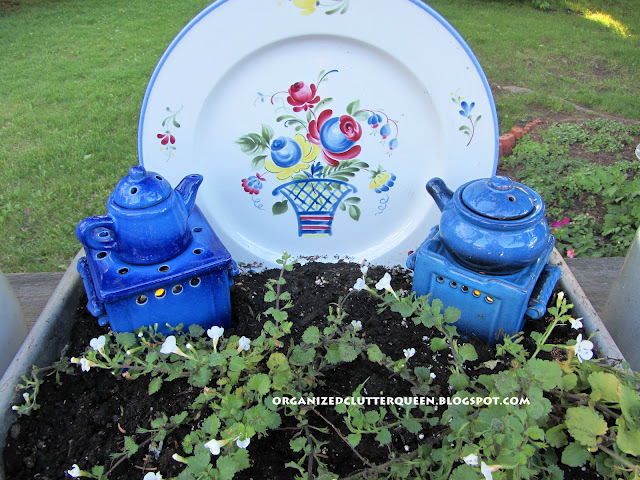 We have just started putting plants in old tea pots and rusty stuff. :) Thanks for sharing these beautiful ideas!